She has graduated over 900 children from her school, some have graduated from higher institutions or are currently enrolled in one. – a girl that graduated from her pioneer set is currently a graduate of engineering and has two major innovations to her name, another has a Non-Governmental organisation that helps in providing quality education for less privileged children and has reached over 1300 children through her work. Mrs Toyin has placed several orphans and children that have suffered from the Boko haram(terrorists) Insurgence in her community on scholarship some of which are now graduates and some are still in her school. She also noticed that most of the young people in her community are into taking hard drugs and most of the young girls would rather get pregnant at an early age than go to school to this note she organised a campaign and invited the National Drug Enforcement Agency in Nigeria to create awareness and educate the youths on the dangers of Hard drugs and teenage pregnancies and further encourage them to go to school. This had a positive effect in the community especially as cases of teenage pregnancies reduced. 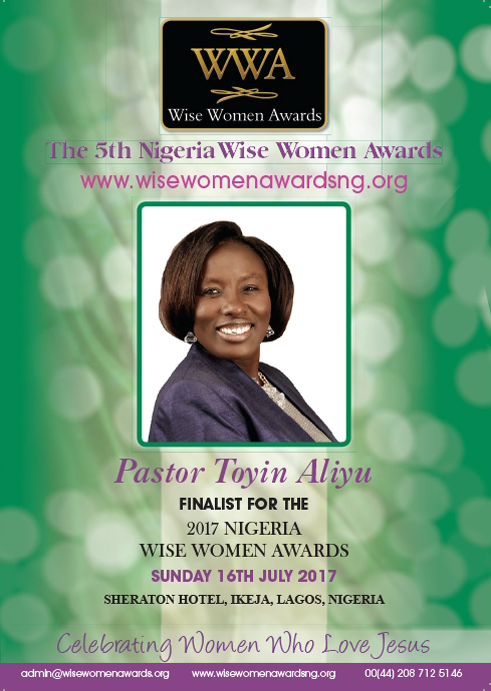 Asides the amazing work she has done in her community, Mrs Toyin Aliyu is a vibrant christian and was ordained a minister of the gospel in 1992. She co-founded a ministry in Jos Nigeria alongside her husband Mr Aliyu known as Kings Watered Garden Ministries. Her ministry is aimed at pruning destinies to the top most, she does this by organizing breakfast meetings every 2nd and 3rd Saturdays of the month in Bauchi and Jos Nigeria respectively. Through her ministry she has empowered over 100 people financially to start businesses, grow in it and in turn empower others, thus creating a ripple effect. She has also given scholarships, especially to orphans and vulnerable children in primary and secondary schools. Paid medical bills for people who can’t afford hospital bills. She is happily married to Mr Aliyu Ekpoki, and has 3 daughters and 2 sons and they all live in Jos Nigeria.